The point system is a system based on different criteria and allowing users to evaluate. After updating Forumotion, the points generated by the member registration will only be taken into account when activating the system with the already existing forums. In this case, the calculation will start from the date of the forum. For other criterias, the timer is triggered when activating the system for the first time and not since the forum creation! For forums created after the update, they already incorporate this system into their database and will automatically calculate the parameters when the admin activates the option. * Show or not the average points per message. * Customize the field name "points". * Choose to display this field in the profile and / or messages. Warning: You need to activate the advanced profile so that this field is displayed correctly in the profile. * Who is allowed to see the field. 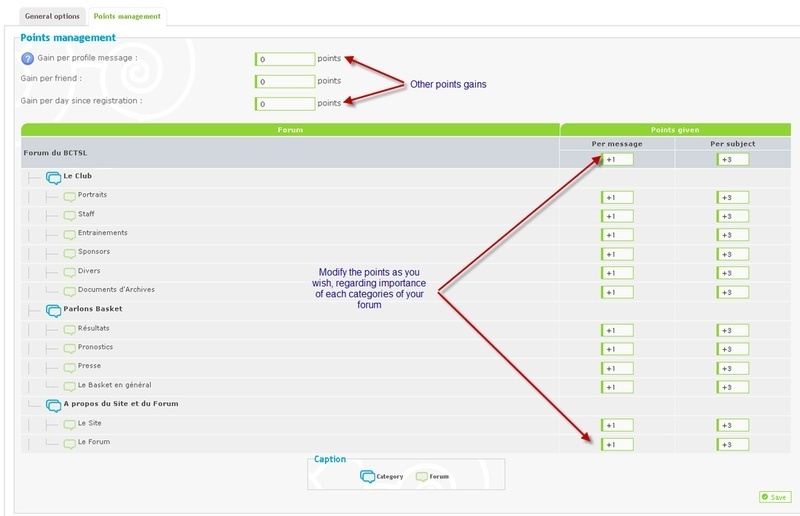 To set the number of points awarded by different actions, go to the "points management". You can also distribute (or take off points: this field accepts positive values such as negative!) the required points for any member and / or group through the "Points donation" section.